It’s official! We’ve moved in to our new office space, and we are loving it! 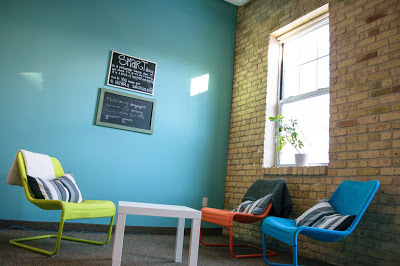 Located in the Creative Enterprise Zone and surrounded by some of our favorite nonprofit friends and small business owners, our new office is the perfect spot. With high ceilings, exposed brick, and lofted work space, it’s also the perfect fit. Although smaller than our previous office, this space allows us to grow, with room for up to 10 work stations! If you’re in the neighborhood, stop in and say “Hi!” We’d love to show you around. In the meantime, we’re still hard at work delivering on our mission, and making a push towards year-end goals. So far, we’ve exceeded our goal (and even our stretch goal!) for engagement of new nonprofits in the Council’s nonprofit review process, the Accountability Wizard®. We’re thrilled to be partnering with new nonprofits every year! We’re also in the midst of bringing our new Diversity, Equity and Inclusion Toolkit online, which will support nonprofits in not only meeting the Council’s Diversity, Equity and Inclusion Accountability Standard®, but also taking the next step towards action. Stay tuned for more details coming soon. Additionally, we’re hard at work planning FORUM 2017, previously known as our Annual Forum. The FORUM will be our biennial event that honors and celebrates the work of the philanthropic sector. In collaboration with our event planning partner- Pollen, and Presenting Sponsor- The Bush Foundation, we’re excited to create an exciting event for our donor and nonprofit partners. We look forward to sharing the Save the Date very soon! Haven’t attended the FORUM in the past? Click here to add your name to the invite list! Last but certainly not least, The Bush Foundation recently announced that Charities Review Council was among the 39 organizations to receive a 2016-2017 Ecosystem Grant. Ecosystem Grants provide general operating support over two years. We’re thrilled and honored to be among such an amazing group of grantees. 2016 has been quite the adventure. Thank you for taking the journey with us. Wishing you all a joyous year-end and a happy new year!